There are many services that can spin a pending price increase into good news. But, at the end of the day, no one likes being told that they have to pay more for anything, and the energy industry is no different. However, according to the energy industry watchdog Ofgem, energy suppliers need to legally inform their customers of any changes that could negatively impact them in any way; and this notification needs to be given at least 49 days before the change comes into effect. During this time your termination fees will usually be scrapped if you wish to seek out a new supplier. 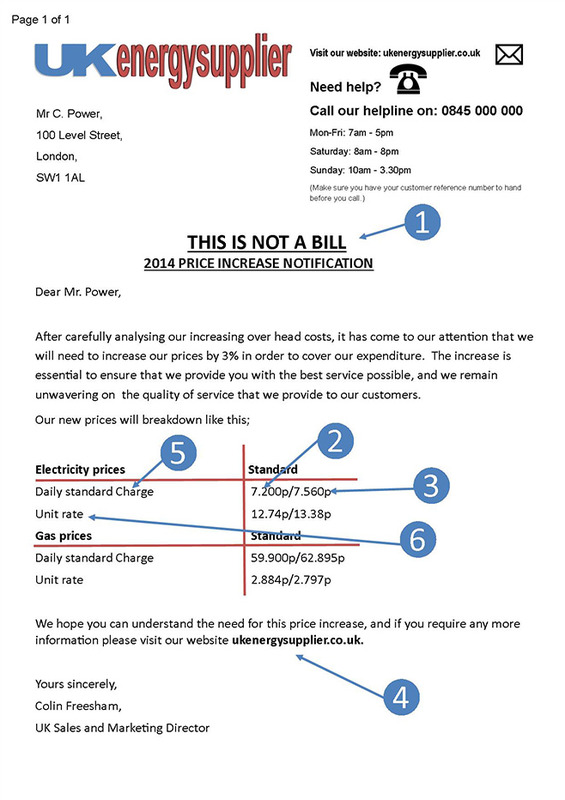 What does a price increase notification letter look like? There is no standard template for a price increase notification letter, and you will find that they can vary from supplier to supplier. However, below you can find some common features to remain aware of. Not a bill notice – Often energy companies will include a notice in a prominent position on the letter that informs the customer that the correspondence is not a bill. Price before VAT – The energy company will provide two figures on your Price Increase Notification letter. This first one indicates the price increase before VAT has been added on. Price increase with VAT – The second figure is the price increase with VAT added. This is the number that you will need to pay attention to. Contact details – With a price increase, a supplier will anticipate questions from their customers so they will usually publish a page on their website to explain the changes. Alternatively, they also include an email and phone number at the top of the letter for you to speak to someone directly about the changes. Standing Charge – Not every energy tariff will have a standing charge, but this indicates the amount that an energy provider charges to facilitate the cost of your house being connected to the grid, any repairs that might be required and any additional charges to help provide you with energy. Unit rate – The unit rate is how much the energy provider will charge for each unit of energy that’s used. Along with this information, your supplier will also offer reasons why the price increase is necessary, and any legal information relating to the changes. Remember, just because your energy supplier increases its prices doesn’t mean you are locked into them. In instances where you are on a special tariff with lower rates, you should contact the energy supplier directly to see if they intend to honour the tariff until it expires. Alternatively, it might work out more cost effective for you to switch. But, it is important to remember that in some instances, customers on a fixed rate tariff might be charged for ending their contract early. To find out if you could stand to save by switching, visit our energy comparison page to find out what the rest of the market is offering. For more information call us on 0800 320 2000.